Jennifer Hahn is the latest young pro golfer to get her first win after turning professional on the Cactus Tour. Hahn's maiden pro win happened on June 10 at the Tour's Event No. 17 at Stallion Mountain in Las Vegas. Hahn, who turned pro earlier this year after playing NCAA golf at Vanderbilt, shot rounds of 71-72-70 to finish at 3-under 213. That was good for a one-stroke win over runner-up Chirapat Jao-Jivanil. A front-nine 33 (that included an eagle on the second hole) in the final round propelled Hahn to the victory. It had to be a particularly sweet victory for Hahn - even more than for "just" getting No. 1 - because it was a hometown victory. Hahn is from Las Vegas and played at Green Valley High School there. 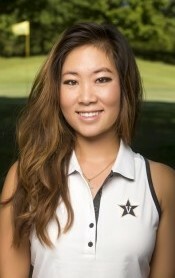 Hahn posted three Top 10 finishes in her recently completed senior season at Vanderbilt. Her career highlights before this included winning the individual championship at the 2014 NCAA East Regional (leading Vanderbilt to the team championship), becoming at that time only the second Vandy female golfer to win an NCAA tournament. She also was co-medalist at the 2015 U.S. Women's Amateur. Golf.com, the website of Golf Magazine, puts together a dozen or so photo galleries every year for its "Most Beautiful Women in Golf" feature. And they also shoot short, behind-the-scenes videos from those photoshoots. And that's what we present here: the videos. Watch and enjoy. Paige Spiranac won for the first time as a professional golfer today on the Cactus Tour. It was Cactus Tour Event No. 16, played at Orange Tree Golf Resort in Scottsdale, Ariz. Spiranac finished at 3-under 213 after closing with a 68, which was the second-best score posted (by anyone) during the event. That 213 total tied Spiranac with amateur phenom Hannah O'Sullivan (who shot 72 in the final round). O'Sullivan won on the Symetra Tour at age 16 and is a Curtis Cupper. She might only be 18 years old, but she's already a "name" player in the game. O'Sullivan and Spiranac advanced into a playoff, and Paige won it on the first extra hole. Spiranac has taken a lot of grief from a lot of quarters because of the way she first gained attention: as a social media star. And, in my humble opinion, almost all of that grief was unwarranted. Hey, if you want to be mad that Golf Digest puts a sexily dressed Spiranac on its cover, go right ahead. But be mad at Golf Digest, not Paige: No golfer - not a single one - would have turned down an opportunity to be a GD cover girl. All Spiranac is doing in cases like this is taking advantage of opportunities presented to her - just as any other golfer in the game would do. Yes, she can break 80. She can even win tournaments. How good she can be as a golfer is up in the air. Most people who try to make a living at professional golf ultimately fail, after all. Three things you can be sure of: Spiranac has talent, takes it seriously and works hard at her game.